Transcend Media Service — That his life and his deeds had black dots is part of the story, but that should not prevent us seeing the greatness of a maker of history. First, in his own society, Venezuela, he lifted those at the bottom from misery to economic wellness, political participation, cultural pride of their often African or Indian blood, and social dignity. Even the rich human rights language is too bland to reflect all that. Second, he did the same for Latin America. He helped lift the bottom countries up, also under the name of the iconic Simón Bolívar–Cuba and Nicaragua, Ecuador and Bolivia, Brazil to mention some. Of course, the two policies are related. Colombia with its immense record of violence (1948–2013) is a pariah country, and can only be lifted up by attacking flagrant inequality. Chávez and his fellow leaders, Castro and Ortega, Correa and Moráles, and Lula, are on line. The leadership of the continent, with Kirchner from Argentina, and the Salvador Allende icon from Chile! They make a formidable team–well beyond the European leaders trying to manage their crises. These words are too dissonant for some Anglo-American minds to handle, but very meaningful in Latin America, particularly when so many leave the Catholic Church, joining the Evangelicals. Many countries have the oil money to do so, and the majority of poor to give them democratic legitimacy. But Chávez did it, inspiring and sharing with other Latin American leaders and peoples, and beyond. Who is the better Christian: Chávez, or a forgettable German with an 11-12th century brain, retired, or tired? Fighting a liberation theology as close to Chávez’ heart as distant from his, if he has any? Leaving that aside–Is Venezuela economically sustainable? The economy is in trouble–lack of investment; and debt to the Chinese is piling up (a minor point as long as oil flows to China rather than to a U.S.A. now turning tar sands into sink holes). The key factor is to make once marginalized, excluded slum dwellers contribute to the economy, strengthening both production, supply, and demand. Many feel threatened by the poor. Then, there is the race factor in Venezuelan society: Will they treat us the way we treated them? Will they outcompete us? Some will sabotage. It’s too late to kill Chávez. But maybe the economy can still be damaged. Many countries feel threatened by the rise of poor countries, for the same reasons. And one more: Will that inspire our downtrodden to do the same? Could blacks in the U.S. Gulf states be interested in a (con)federation with Caribbean countries populated the same way? Somebody is working 24/7 for Venezuela not to succeed, for sure, but it may be too late. The egg has been stood on its head, and Chávez did it. The thought has been not only conceived, but enacted and, given the enthusiasm and the dedication of the born-again in red T-shirts, Venezuela will probably make it. There are questions beyond Venezuela’s future on the horizon. 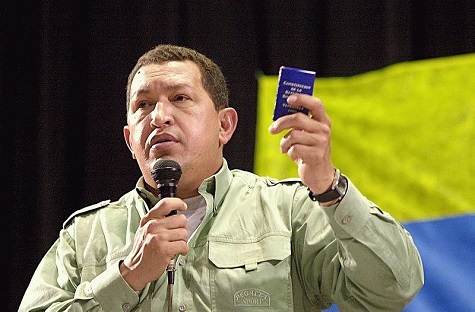 It will be difficult for economists to stick to their “trickle down” illusions, given Chávez’s bold option. But positive discrimination is sometimes an indispensable shock therapy to lift those in misery–women all over, non-whites, Malays in Malaysia, Dalits in India–even if it “destroys market mechanisms”–for the short time it took to have an effect in Venezuela. Economists should help lifting those at the bottom, in those countries, too, that are not oil rich. It will also be difficult for left-wing extremists to see Fidel’s line as the only possible option. Western democratic legitimacy, diverse symbiotic economy and strong ethical motivation may carry us further. But the West has a tendency to confuse violence with conflict; ceasefire and disarmament of “rebels” with solutions; multi-party national elections and democracy with mediation; and the rule of law leaves out acts of omission, as human rights leave out people’s rights. It will also be difficult for politicians to hide their lack of initiative behind anti-populism. Chávez has shown that what people want–dignity­­–is not populist in the sense of promising the undeliverable, but even in the short-term feasible.